The Studebaker Commander was produced for several years, representing several body style changes, and first appeared in the 1920s. The company would continue to use the name until their demise in 1966. There were only a few years where the Commander did not appear in Studebaker's line-up during that time; those were in 1936 and 1959-1963. The Commander moved up-market in 1939 when Studebaker introduced the Champion model. 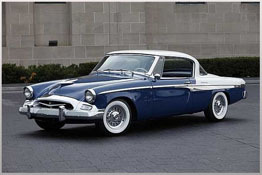 After the Second World War, Studebaker dropped its President moniker, and repositioned the Commander in its place. At the same time, Studebaker introduced an extended wheelbase model known as the Land Cruiser.